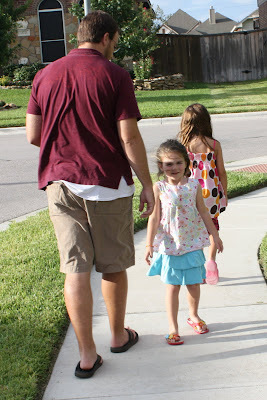 We took a family walk on our family night last week. 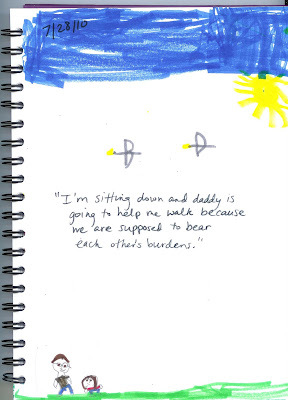 We used this great FREE resource from Family Time Training. The “Walk”: Each of us takes turns walking backwards while the others walk forward. Notice if the walk slows down or if stumbling occurs. The “Talk”: Is it easier to stumble moving forward or backwards? Can you see the goal ahead of you when you are walking backwards? What happens when you are always looking behind? The “Walk”: Have each person trade shoes with another family member. The “Talk”: The Bible tells us to love our neighbors. One way to do this is to try to understand them better. There’s a saying about putting “ourselves in the other person’s shoes” when we are having a hard time understanding someone. (This is especially important to talk about with Rilyn who will encounter children at school that are very different from her.) Talk about if you had to suddenly live in one or our neighbor’s lives would it be easy? How can we be more understanding? Pray for them! James trying to walk in Rilyn’s flip flops! 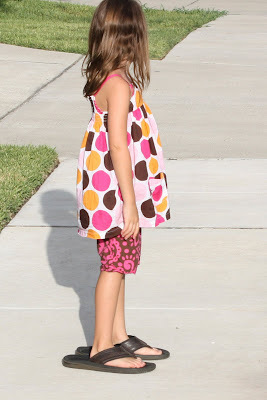 Rilyn trying to walk in daddy’s flip flops! Too heavy! The “Walk”: Have one person sit on the ground as if not able to move. The others will have to help carry the immobile member. The “Talk”: How can we all get to our goal together if one person can’t walk? How did it make you feel to know you were helping someone else? A helpful thing we have started this past year is ‘family night journals’.The girls record what they learned immediately after the family night. 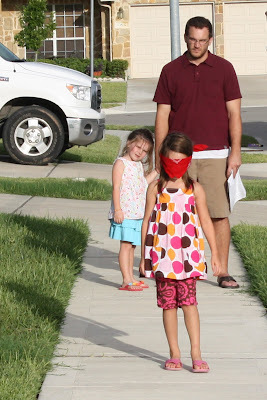 The “Walk”: Take turns blindfolding each person one at a time and have them walk a distance without being able to see. The “Talk”: Could you walk in confidence when you couldn’t see? Why do you think Jesus warns us to not walk in darkness? How is walking without Jesus like walking blindfolded? The “Walk”: Have everyone crawl on their knees with the exception of one person. Have one person walk upright. The “Talk”: Which person automatically moves to the front of the group? What kind of person is the Bible referring to when it speaks of someone who walks upright? We plan on using this family night every year because it is so easy and our discussions will hopefully just get deeper and deeper! Oh, and where was Asher? He was with us, just along for the ‘ride’! He now only cruises with his feet lounging like this. I’m so glad I found your page. I’m the Children’s Director at our church so I’m always looking for creative ideas to bring to the the kids and your page has some wonderful assortments of teaching tools. 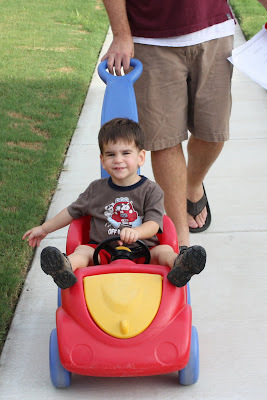 I am always looking for new activities to do with my Sunday school class and my 5 year old son. Thanks so much for sharing and I can’t wait to do all of the lessons with my little ones. God bless you and your family. Thank for posting. I was looking for a lesson for children’s church when I ran across your post. This is awesome. Playing while learning is how we do it. My kids will be having a blast! I love this, I’m looking into some short studies for our ladies night that they can take home and use as well as journal about. Give them and their families food for thought. This is a fabulous lesson no matter what age! Thank you for sharing!!! Thank you for sharing, always looking for good ways to teach the youth group. God bless you n your family.